I got motivated to make this class this AM. This is inspired by the Blood Magus prestige class from the Complete Arcane of 3.5 days. Hope you enjoy! You have learned the secret art of controlling the blood of others. Not merely content of learning spells and studying tomes as a wizard, you manipulate the life essence of creatures and use that to bolster yourself, or harm and hinder others. You revel in the smell of blood, its taste, and warmth, even as it leaves your victim and cools and congeals in an ever growing pool on the floor… You are twisted… you may even be evil… and you absolutely love it. Hit Points: A Blood Witch gains 1d4 HP per level. Weapon Training: A wizard is trained in the use of the dagger, longbow, longsword, scythe, shortbow, short sword, sickle, and staff. Blood Witches rarely wear armor, as it hinders spellcasting. Alignment: Blood Witches manipulate the body and functions of other living beings and dabble in the grossest of magic and by that nature are chaotic. Blood Potion: The Blood Witch is able to craft a potion from her own blood, sacrificing 1d4 HP that will heal naturally or can be healed magically. The Blood Witch can drink this potion at a later date and regain 3d4 HP back. The potion takes 6 hours to brew and 100 gp in components. A Blood Witch cannot have more than 3 of these made at a time. Blood Walk– A Blood Witch can play a dangerous game and jump through a living creature that is the same size or larger than herself and travel through their blood and emerge from another living creature on the same plane of existence. The Blood Witch rolls d20+level+Stamina modifier and consults the chart below to see the distance she is able to travel. Armor affects this ability. Using this ability is a movement action. The creature must be alive and have red blood for this travel to work. 1 Lost (24 hours). Failure. And Worse! Make a DC 18 Stamina Roll- Failure means the Blood Witch suffers 1d8 damage and gains: 1-3) Minor Corruption; 4-5) Major Corruption; 6) Greater Corruption. 2-11 Lost (24 hours). Failure. 12-13 You are able to travel up to 1/2 mile through the blood of others. You can choose to emerge early through the target and do 1d8 damage. The target must succeed a DC 12 Fort save or be stunned for 1 round. 14-15 You are able to travel up to 1 mile through the blood of others. You can choose to emerge early through the target and do 2d8 damage. The target must succeed a DC 14 Fort save or be stunned for 1 round. 16-17 You are able to travel up to 2 miles through the blood of others. You can choose to emerge early through the target and do 3d8 damage. The target must succeed a DC 14 Fort save or be stunned for 2 rounds. 18-19 You are able to travel up to CL miles through the blood of others. You can choose to emerge early through the target and do 5d8 damage. The target must succeed a DC 16 Fort save or be stunned for 1d4 rounds. 20-24 You are able to travel up to double CL miles through the blood of others. You can choose to emerge early through the target and do 6d8 damage. The target must succeed a DC 16 Fort save or be stunned for 2d4 rounds. 25+ You are able to travel anywhere in the world through the blood of others. You can choose to emerge early through the target and do 8d8 damage. The target must succeed a DC 18 Fort save or be stunned for 3d4 rounds. 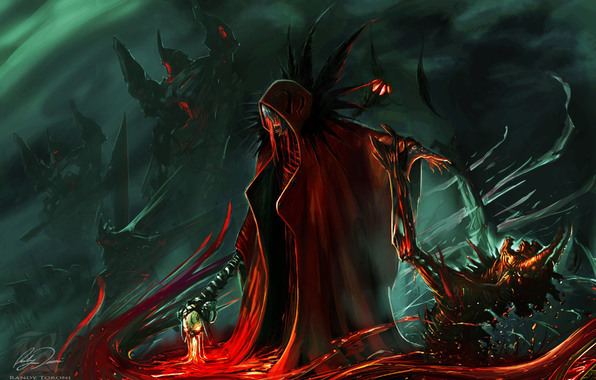 Coagulate– The Blood Witch can cause a targets blood to thicken, making it difficult to move and act. The target must succeed a Fort Save DC 10+Blood Witch’s level and Stamina Modifier. Failure means their movement is slowed to1/4 and they roll all physical type rolls 1 step lower on the die ladder. This effect lasts for 1d4+Blood Witch’s level rounds. 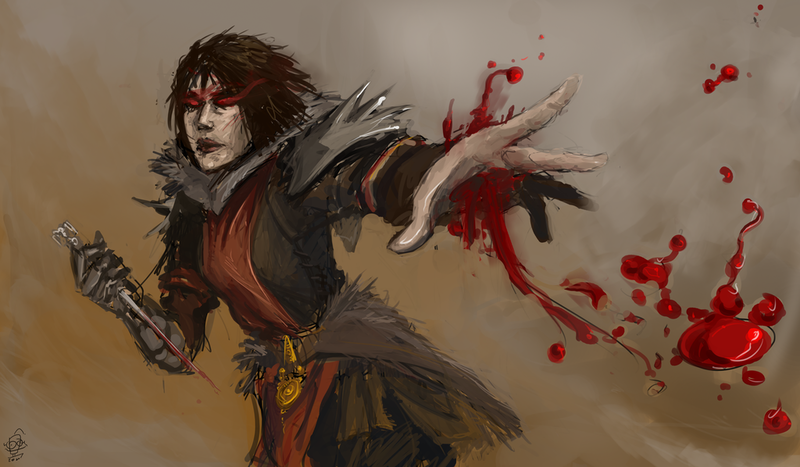 Inflict Wounds– A Blood Witch is able to touch a target and coax their blood from their body. This functions as a Cleric’s Lay on Hands ability (DCC, pg 31). A Blood Witch rolls d20+ Staminia modifier+ Blood Witch level. If the Blood Witch succeeds the roll the target rolls the number of HD and suffers that much damage. The target is allowed a Fort Save (DC same as Blood Witch’s roll) to take half damage. 1-11 Failure. Lost (24 hours). Spells– A blood witch is able to cast arcane spells, but at great peril to herself. A Blood Witch must spellburn either their own stats or the stats of another to fuel their spells. To spellburn from another target the Blood Witch indicates who she is drawing from and they must succeed a Fort Save DC 10+Blood Witch’s level and Stamina Modifier. 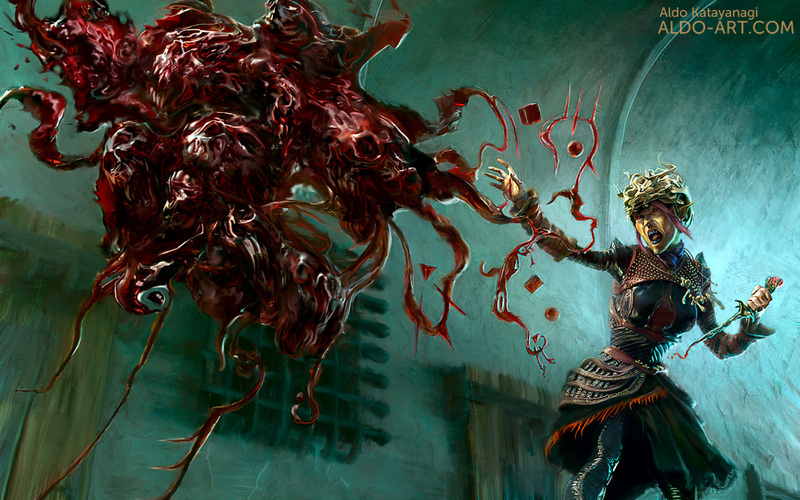 If they fail the Blood Witch draws 3d6+ ½ her level from them that she can use to Spellburn. If the target succeeds the Blood Witch suffers the loss to her own stats and the spell fails. To cast spells a Blood Witch rolls 1d20+points spellburned+Stamina modifier. She does not get to include her level in the casting roll. The Blood Witch also suffer negative effects on a 1 and 2 rather just a 1 on spell casting. Languages: At 1st level, a Blood Witch begins able to speak common. This entry was posted on Friday, July 18th, 2014 at 7:14 am	and posted in Dungeon Crawl Classics, Hubris Campaign Setting, Role-playing. You can follow any responses to this entry through the RSS 2.0 feed. This entry is an example of why your blog is one of my favorites. I asked you in the past to know if I had permission to translate your TBH classes into Spanish, and I ask you again because this DCC class is fantastic. Giving you all credits, of course!